Induction cooking isn’t super common these days, but more and more cooks are turning to induction cooktops. This means prices on induction stoves are more affordable than ever, and it also means that there are more options when it comes to cookware that works with induction. The induction cooktop looks like a glass stove, but there are significant differences in the way it functions and its requirements. Primarily, you can’t just use any old pot or pan on an induction cooktop. Because of the electromagnetic field that quickly and evenly heats cookware, your pots and pans need to be magnetized — you can test it out yourself simply by sticking a magnet on the bottom. Induction stoves can be found on ovens, like this Kenmore Elite, and induction cooktops are available for the countertop and can be easily stored (check out this Cuisinart Double Induction). So, even if you’re not ready to commit to completely replacing your range, you can still add induction cooking to your kitchen. Cooks love induction because it gives so much power and precision. It can completely revolutionize cooking. For example, it can boil water several minutes faster than other cooktop types. It’s highly sensitive to temperature changes, which gives you much more control over everything you’re making. The nature of the induction cooktop requires magnetized materials in order to work. If you test it yourself, note that a strong magnet pull indicates it should work well. Less pull means it may not work. In general, cast iron (enameled and bare) and most stainless cookware are compatible. The nickel content in stainless can affect its ability to work on induction, which is why not all stainless cookware is compatible. 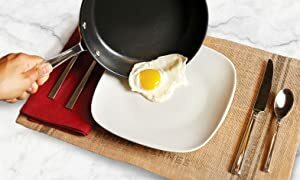 Your very best bet is to seek out cookware that is labeled “induction compatible” or “induction ready.” However, I have seen quite a few sets and pieces that multiple customers have experienced issues on their own induction cooktops. I recommend reading lots of reviews before you commit to cookware — especially if it’s expensive. Having multiple layers (also known as multi-ply) is important, as most 2-ply cookware lacks the heavier materials and magnetic outer core that makes for good induction usage. Here are some cookware sets and pieces to get you started. Bottom line: Cast iron of any kind is an excellent match for induction cooktops. Both bare and enameled cast iron are fine to use and heat extremely well on induction. In fact, this is the only material you can consistently count on compatibility without searching out specific models. If you’re looking for affordable recommendations on cast iron, we like the Lodge brand cast iron products, like this skillet and this enameled dutch oven. You can read more about cast iron dutch ovens here. Stainless steel is your best bet for everyday induction cooking in a range of shapes and sizes. However, you’ll learn pretty quickly once you go searching that finding stainless that is induction-compatible isn’t simple. For the most part, you’ll be fine choosing a quality brand that is labeled “induction ready.” Do take note on some of the cheaper options that the cookware isn’t always flawless on induction. Here are some of your best bets for stainless steel that works with induction cooktops. 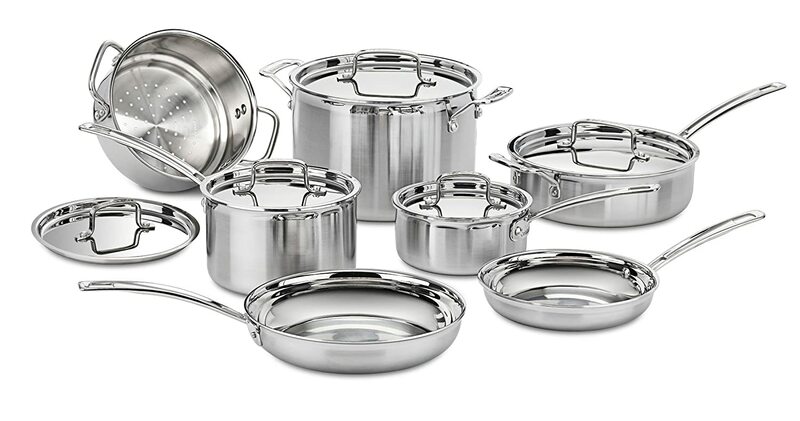 1) Tramontina’s 12-Piece Gourmet Prima set is a solid mid-price stainless set that happens to be induction ready. This has become one of our favorite sets overall, and we can recommend it as a well-priced, high-quality set for induction cooking. There are also 8- and 10- piece sets available. 2) The Cuisinart MCP-12N Multiclad Set is another top pick overall for stainless cookware, and it is induction compatible. This is a 12-piece that is oven- and dishwasher-safe. The Cuisinart comes in at a slightly lower price than the Tramontina, so it’s another good bet for a mid-price set that saves you a bit of money. 3) Made In Cookware is a USA-made, direct-to-consumer brand we love, and their stainless is induction ready. 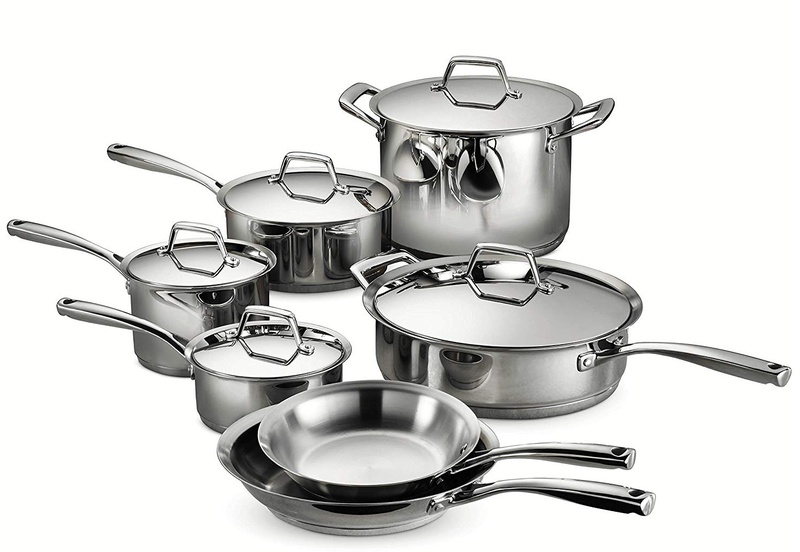 Whether you want a large or small set or just a nice frying pan, this a great option for affordable premium cookware. Sets like The Starter (right) offer useful pieces that work very well with induction cooktops. Made In is one of the few premium cookware lines that is made in the U.S., and they offer transparency in pricing and manufacturing. Read my hands-on review here. Like stainless, it can be a bit complicated to find a nonstick pan that’s actually induction ready. There are plenty of options, of course, but you do want to be careful with buying nonstick and nonstick alternatives like ceramic — not all of those labeled “induction safe” work well. We have a few recommendations that we like and that seem to have consistent results for actual customers. All-Clad is an excellent cookware brand, and their hard anodized nonstick frying pans are my personal favorites. The full set of hard anodized nonstick is another good option if you’re interested in multiple pieces of nonstick. This 13-piece set has everything you could need and each item is induction ready. Want a less expensive option? 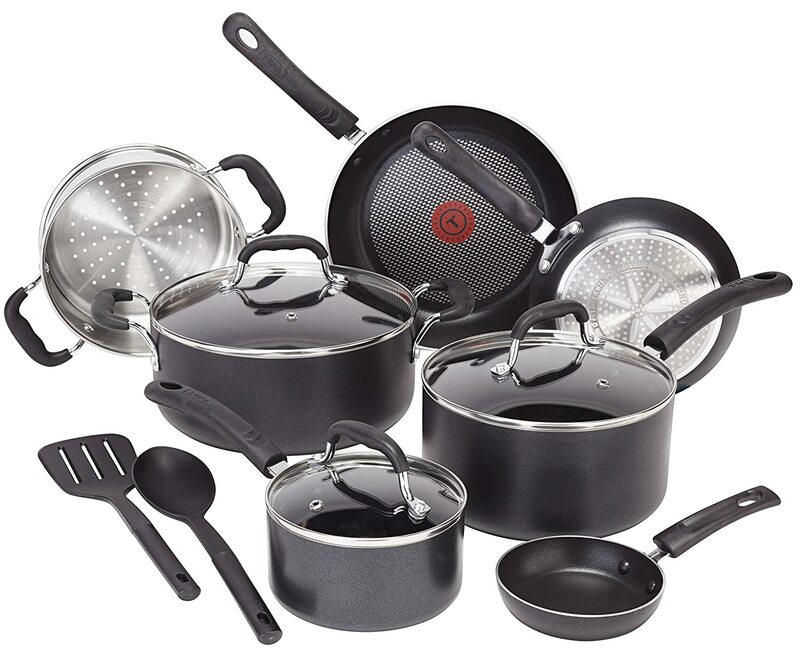 Check out this Circulon Infinite Hard Anodized 10-Piece. For traditional nonstick, the T-fal Thermospot (make sure to select the Induction version!) is a relatively inexpensive set that includes 12 pieces and is induction ready thanks to a stainless steel induction compatible base. It’s one of the only cheaper sets that we’ve found that actually works with induction and has an under-$200 price point. It gets especially tricking moving into ceramic cookware territory, but we’ve found the Vremi 8-Piece Ceramic Set to have the most consistent reviews from customers. It’s also very affordable and ranks among our top picks for budget and ceramic cookware. Other ceramic cookware, even when described as induction compatible, seems to be pretty hit or miss. What brands do you like for induction cooking? We’d love to hear your recommendations in the comments!